Home / Unlabelled / CELEBRATING EBUBECHUKWUZO, A MAN OVER THE MOON . CELEBRATING EBUBECHUKWUZO, A MAN OVER THE MOON . What an honor and privilege it is to say a few words as a tribute to Dr. Patrick Ifeanyi Ubah as we celebrate his birthday. Daily, incrementally and exponentially, we have seen this hero walk steadfast and purposeful through the hard and the soft. Despite all even tribulations, he has remained positive and empathetic. Dr. Patrick Ifeanyi Ubah embodies a passion and zest for life that is infectious and we have all shared in these moments. Today as you stand on the brink of a new chapter in your life, may you note that we are so incredibly proud of you and we love you. We wish you a magical day that is profoundly happy and richly blessed. We appreciate the special and unique role you play in our lives - long may you continue to do so. Today, may you know that you are admired and loved by your family, as a special and caring father, friend and boss to many and as a colleague of note to fellow barons. Today, we stand to acknowledge your unflinching support upon us- through times of adversity and throughout the celebrations in our lives. Your strength, care and support continues to brighten our days in so many wonderful ways - unfailingly, uncompromisingly and unyieldingly. May you continue to walk as surefooted as you always have, may you remain as grounded as you have always been...and may you stay in mind and spirit, forever young . 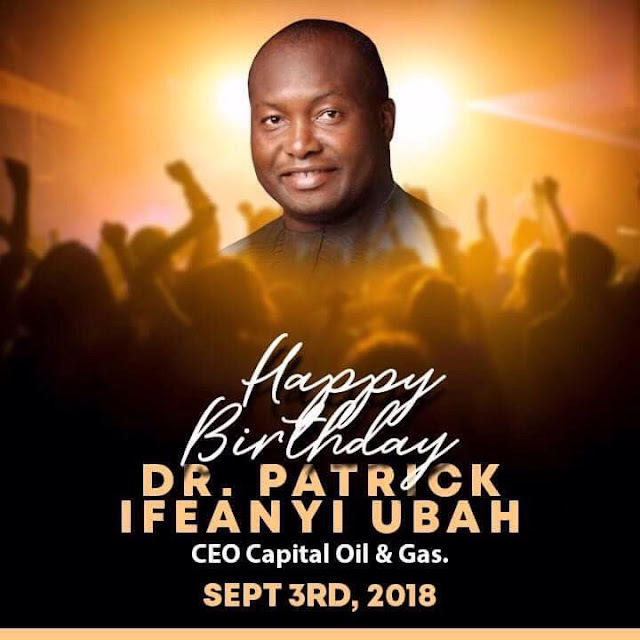 Happy Birthday to Dr. Patrick Ifeanyi Ubah. A Mentor and Lord !